Exit Sarasota Airport and turn right on University Parkway. Continue .3 miles to SR-41. Turn left on SR-41 (Tamiami) and continue 9.4 miles south staying on SR-41. Turn right on SR-72 (Stickney Point Road). Go over the Stickney Point drawbridge leading to Siesta Key. Turn right on Midnight Pass Road and go approximately 1 mile on Midnight Pass Road. The Gulf & Bay Club Bayside will be on the right. Exit Tampa Airport and take I-275 south to I-75 south. Exit at the 3rd Siesta Key exit - exit 205 (SR-72 - Clark Road). Turn right (west) and continue 5.5 miles on Clark Road which will become Stickney Point Road. 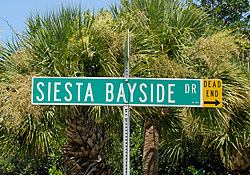 Go over the Stickney Point drawbridge leading to Siesta Key. Turn right on Midnight Pass Road and go approximately 1 mile on Midnight Pass Road. The Gulf & Bay Club Bayside will be on the right. Take I-4 west to I-75 south. Exit at the 3rd Siesta Key exit - exit 205 (SR-72 - Clark Road). Turn right (west) and continue 5.5 miles on Clark Road which will become Stickney Point Road. Go over the Stickney Point drawbridge leading to Siesta Key. Turn right on Midnight Pass Road and go approximately 1 mile on Midnight Pass Road. The Gulf & Bay Club Bayside will be on the right. Take Daniels Parkway west to I-75. Take I-75 north and exit at exit 205 (SR-72 - Clark Road). Turn left (west) and continue 5.5 miles on Clark Road which will become Stickney Point Road. Go over the Stickney Point drawbridge leading to Siesta Key. Turn right on Midnight Pass Road and go approximately 1 mile on Midnight Pass Road. The Gulf & Bay Club Bayside will be on the right.